Ligustrum is a genus of about 50 species of deciduous, semi-evergreen, or evergreen shrubs and trees found in woodland and thickets in Europe, north Africa, the Himalayas, Asia and Australia. They bear opposite, variably shaped, often glossy leaves. In summer they carry panicles of small, unpleasantly scented white flowers followed by small round fruit. 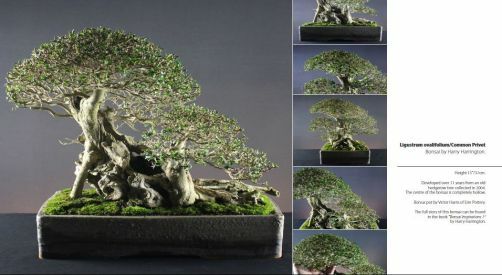 Many species of Ligustrum are used for hedging and this can provide an excellent source of material for bonsai. Ligustrum make good material for beginners as they are very forgiving and virtually indestructible. L. ovalifolium is a vigorous, upright, evergreen or semi-evergreen shrub with oval, rich green leaves to 6cm long. White flowers are borne in dense panicles to 10cm in mid-Summer followed by spherical, shiny, black fruit. Originally native to Japan, the Oval Leaf Privet can reach heights of 4metres with a 4metre spread. L. vulgare is a deciduous or semi-evergreen shrub with narrowly oval, dark-green leaves to 6cm long. White flowers are produced in panicles to 5cm long in early and mid-Summer followed by spherical black fruit. In its native Europe, north Africa and Asia, the Common Privet is less vigorous than the Oval Leaf Privet but can still reach heights of 3metres with a 3metre spread. L. sinense is a vigorous, bushy, tree-like, deciduous or semi-evergreen shrub with arching branches and elliptic-oblong pale green leaves to 7cm. White flowers are profusely borne in panicles to 10cm long in mid-Summer and are followed by black spherical fruit. In its native China, Ligustrum sinense reaches heights of 4metres with a 4metre spread. POSITION Full sun or shade, Privets are very tolerant of both full sun in the Summer and quite deep shade. Privet are fully hardy and only require additional frost protection when temperatures drop below -10°C, however during the winter the colder the temperatures Privet are exposed to, the more leaves they drop; this is a natural reaction and causes no permanent damage even when specimens lose all their leaves in severe cold. The following Spring, new growth very quickly replaces any foliage lost during the Winter. Ligustrum are also sold as indoor bonsai and will also tolerate indoor growing conditions as long as humidity levels remain reasonably high with the use of humidity trays. Ligustrum that are left outside during the Winter must have spent the Autumn outside in order to acclimatise to the cold. Do not place trees that have been grown inside straight outside in the Winter as they will not have hardened off and it is better to leave them inside until Spring. FEEDING Feed fortnightly during the growing season, indoor species should only be fed monthly during the Winter whilst in active growth. REPOTTING Annually in Spring as new buds extend; use a basic soil mix. PRUNING Trim to shape through the growing season, remove overlarge leaves and shoots with overlong internodes. Hard prune during the late Winter or early Spring before new growth starts. Wiring can be carried out anytime, though Spring-Summer is best. PROPAGATION Sow seed outside in Autumn or Spring. Take semi-ripe cuttings in Summer or hardwood cuttings in Winter. Air-layerings can be taken in late-Spring. PESTS AND DISEASES Aphids, leaf spot, scale insects, leaf miners, thrips, wilt. STYLING Informal upright forms with single or multiple trunks in all sizes.